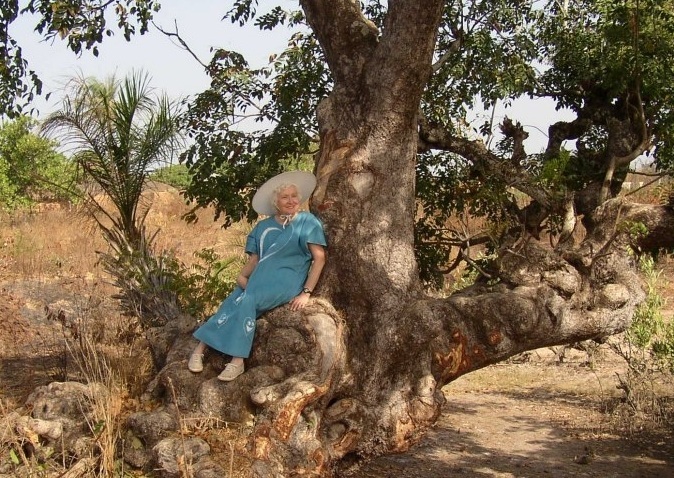 Martha Reynolds during one of her many trips to Guinea-Bissau in the 1990s and early 2000s. Why invest in Guinea-Bissau, a small country that many have never heard of? Martha and Herb Reynolds thanked supporters at the 2015 Dine & Discover West Africa Dinner Banquet in Fresno, CA. This tiny corner of West Africa is not an easy place to work in. It has had more military coups than perhaps any other country in the region. Its Portuguese roots isolate it from its English and French speaking neighboring countries. Even by African standards, Guinea-Bissau is severely under-developed. But these challenges are what inspired WAVS founder Martha Reynolds to work in this almost-forgotten land. She realized that, despite its difficulties, Guinea-Bissau has incredible potential. When Martha boarded a plane in 1994 for West Africa, she didn’t know that it was the first step of a journey that would give her the opportunity to partner with local leaders and be a part of Guinea-Bissau’s transformation. At the time, all she wanted to do was to serve with a church on a short-term trip to Guinea-Bissau. But when she returned home, her thoughts and prayers kept bringing her back to West Africa. So Martha, a retired Boeing quality engineer living in the Seattle area, took several more trips to Guinea-Bissau. With each visit, she formed new friendships and learned more about the country. Her initial goal was not to complete projects; it was to understand the country and get to know its people. In 2000, after several trips, Martha and a small group of supporters formed the nonprofit that became West African Vocational Schools. Martha, a widower at the time, married Herb Reynolds in 2002. The pair traveled to Guinea-Bissau almost every year from 2003 to 2012, often spending up to six months at a time in the country and laying the groundwork for partnerships with local leaders. Martha Reynolds and a local pastor stand in front of the site of the WAVS School during its first phase of construction. Through the many relationships they developed living among Bissau-Guineans, Herb and Martha identified a partnership opportunity to work with local leaders in the rural town of Canchungo, a community of about 20,000 people with no paved roads and no electricity. With few options for job skills training, young people in Canchungo either survived on subsistence farming or left their families to work or study in the capital city. Some were even drawn in to drug trafficking, which promised easy money. The WAVS School has served more than 1,000 students since opening in 2006. Community leaders asked Herb and Martha if they would work with them to build a vocational school – a place where young women and men could receive job skills training so that they could provide for themselves and their families. Instead of hand-outs, the community wanted the chance to have a sustainable future. Herb and Martha shared this vision with the WAVS Board of Directors and a partnership was formed. The WAVS School opened in 2006 with a small auto mechanics program. The next year, the school added a sewing and computer basics program. Additional courses followed: English in 2011, welding in 2012, and French in 2014. With the exception of one instructor from Northern Ireland who spent two years starting the English program, all the staff at the school have been Bissau-Guineans.To date, the school has provided life-changing job skills training to more than 1,000 young women and men. It now serves more than 200 students each year. WAVS began as an entirely volunteer-run organization. In 2011, it hired Chris Collins as executive director. A year later, the school hired Almamo Danfa as school director. Chris and Almamo worked closely together, along with the WAVS Board of Directors and local leaders in Guinea-Bissau, to grow the school and improve the quality of its programs. The mission of the school is still the same: To equip young women and men with life-changing job skills so that they can transform their communities – all while sharing God’s love through word and deed. The new campus in Bissau will serve up to 1,000 students each year. WAVS and its U.S. staff are based in Fresno, California, though its board members and its many dedicated volunteers are spread across California and Washington State. In 2015, as part of its vision to partner with local leaders to help transform West Africa, WAVS began the process of establishing a second campus in the capital, Bissau, which will serve up to 1,000 students a year when fully completed. It has been more than two decades since Martha first traveled to Guinea-Bissau. In that time, hundreds of young men and women have been given the opportunity they need to pull themselves out of poverty and provide for their families. As we work together with a growing network of partners and supporters, we look forward to building on this initial success to raise up the future leaders of Guinea-Bissau. They are ready. Let's give them the opportunity.